Building Technology Consultants, Inc. (BTC) has earned the 2011 Trinity Project Award from the Sealant, Waterproofing, and Restoration Institute (SWRI) for its design and construction oversight of exterior window and wall repairs of Northwestern University's O.T. Hogan Biological Sciences Building (Hogan Building), located on its Evanston, Illinois Campus. Entries for this prestigious award were judged on project complexity, technology/innovation, sustainment, safety, community/environmental impact, and other criteria. A documented collaborative team approach between the project consultant, contractor, and materials manufacturer was also required for eligibility. SWRI is a non-profit corporation of leading commercial contractors, manufacturers, and consultants engaged in the application, design and manufacture of sealant, waterproofing and restoration products. The Hogan Building, housing administrative offices, research laboratories and classrooms, is a 5-story concrete frame structure constructed in the late 1960's. The building's facade consists of textured limestone panels with mahogany frame windows arranged in a vertical strip fashion. The windows are off-set at every floor resulting in various window widths at each vertical group of windows. The owner desired to have a modern aluminum window system that matched the aesthetic appeal of adjacent buildings, provided improved thermal and water penetration resistance, and could be replaced with minimal disruption to the interior operations of the building. During its initial evaluation, BTC also noted distress in the limestone panels. BTC developed a unique custom-extruded cladding system for the window frames that included drainage type glazing pockets and other improvements over the original design. The repairs were designed to be performed entirely from the building exterior, minimizing interruptions to building interior, and resulted in cost savings as compared over other options such as full replacement. 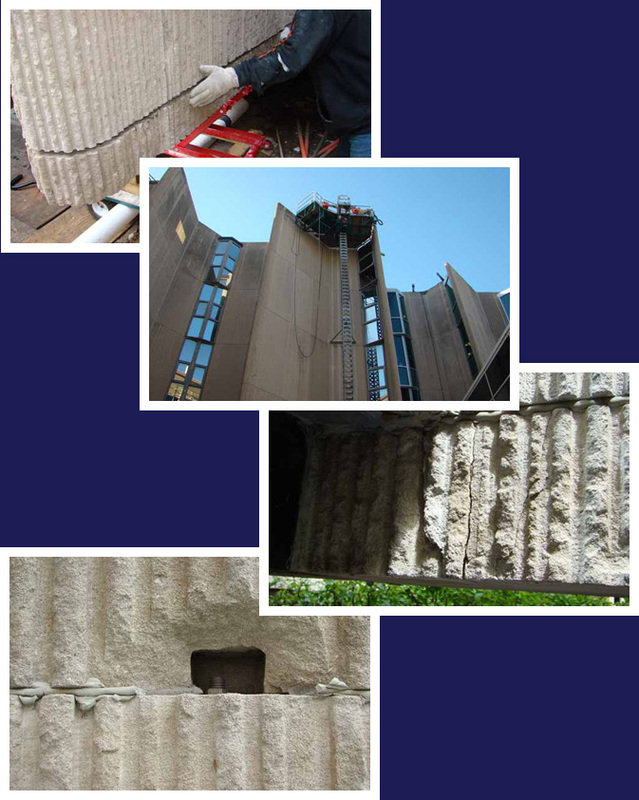 In addition to the window rehabilitation, full perimeter sealant replacement, localized patch repairs, and stabilization for limestone panel supports were performed at the limestone facade panels. To see additional details about this project, please view the Project Profile.